TheGunBlog.ca — The Royal Canadian Mounted Police said it’s “continuously reviewing” its web pages on Bill C-71 to ensure clarity and avoid confusion, after facing criticism for enforcing a draft law that hasn’t been approved by parliament. March 20: Government proposes Bill C-71 to ban more firearms and further restrict federally licensed hunters, farmers, recreational shooters and competitors. May 8: RCMP publishes web pages on “How does Bill C-71 affect individuals?” and “How does Bill C-71 affect businesses?” ordering compliance with measures and deadlines in draft text of law. May 9: TheGunBlog.ca is first to report how the website seeks to enforce the draft law. May 29: Opposition MP Glen Motz tells House of Commons the RCMP website on Bill C-71 undermines the authority of parliament. 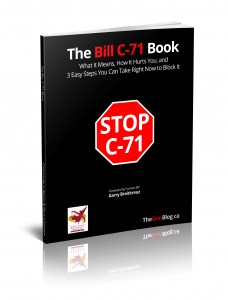 May 30: RCMP updates Bill C-71 web pages, changes title to “How would Bill C-71 affect individuals?” and adds introduction saying content is to provide guidance if proposed bill becomes law. June 4: RCMP tells TheGunBlog.ca it’s “continuously reviewing” the website to ensure clarity and avoid confusion. The federal police manage licensing, registration and daily monitoring of Canada’s 2.1 million lawful gun owners and their firearms. TheGunBlog.ca asked about the updated language on the Bill C-71 website and the rationale for publishing orders, instructions and deadlines relating to a draft law. The RCMP is continuously reviewing its website content to ensure that it addresses the issues as efficiently, and with as much clarity, as possible. The website text was adjusted to avoid any potential confusion regarding the status of the legislation. This is part of regular work that is undertaken, making every effort to provide the most current information on our website.